Sneha Shrestha and her organization, Sneha’s Care, have created a film that highlights the inhumane methods used in transporting water buffalo from India to Nepal. The film is called, Live Animal Transportation, and it shows the horrific conditions and torture that the animals face while being transported lengthy distances, as well as the inhumane treatment they face at the slaughterhouse. The video was very effective in creating a strong and lasting impression in the mind of the viewer. The long-distance transport of animals results in great suffering to the animals. Rangjung Yeshe Shenpen is thrilled to support this cause and have always believed that this kind of suffering should end immediately, and that strong legislation should be introduced to STOP this kind of suffering. With a great dedication to the development of this documentary film, Sneha’s Care has found the response to the film very positive. 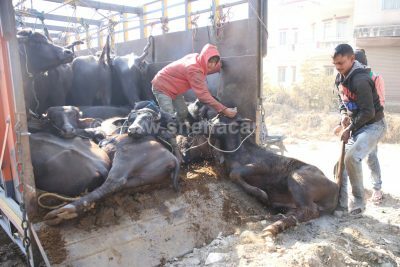 They have now been able to implement, The Animal Transportation Standard by the Nepal Government after eleven years of hard work. Initially known as, “The Animal Transportation Standards, 2007”, it was limited just in paper and was not implemented until now. 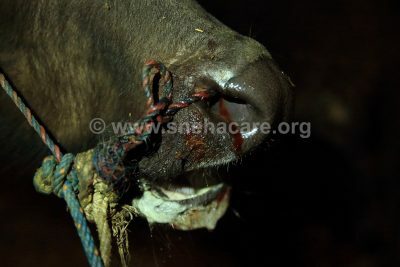 Because of Sneha’s work, the nose and tails of the water buffalo can no longer be tied while they are being transported. We would like to salute the tremendous work of Ms. Sneha Shrestha and her bravery and dedication in travelling along with these water buffaloes, allowing her to capture the cruelty and pain they were facing in live transportation. Thank you, Sneha, for showing this video to the world and running a campaign to end this cruelty.